When Chance is asked by sexual abuse counselor Lorna Savicki to find a missing client, he jumps at the opportunity. Not only is he looking to take on a legitimate investigation for a change, he’s always carried a torch for Lorna. The missing woman, Torrie Wilkins, is a former drug addict, prostitute, and one of Lorna’s successes. With Lorna’s help, Torrie appears to have cleaned up and put her past behind her. Before she vanished, she was on the eve of graduating from college, and had named her baby daughter after the mentor who saved her; Lorna. But the more Chance searches for Torrie, the more his legitimate investigation takes a wrong turn. The case leads him to Nevada, where he butts heads with Wilkins’ meth-cooking ex-pimp. That fateful meeting puts him on a collision course with an outlaw motorcycle gang; men not inclined to negotiate or forgive. By the time Chance gets back home to the San Francisco Bay, his encounter with the biker gang has erupted into full-scale war. A war being waged not only against him, but against his friend Lorna and the toddler who bears her name. To stay alive, protect Lorna and the child, and find Torrie, Chance must jettison any pretense of legitimacy his investigation started out with. For if there’s one thing his military and law enforcement experience taught him, it’s that to survive you do what you have to-whatever it takes. 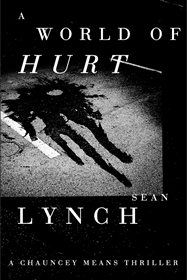 "Retired copper, Sean Lynch is the real deal. He’s no stranger to human conflict and knows first-hand the heights and the depths to which people can rise or sink. Chauncey Means is an Everyman sort of hero—muscle for the underdog, trying hard to do the right thing, even when that thing is not always completely legal. A WORLD OF HURT sprints right out of the gate and never lets up. Good stuff. Really. Good. Stuff."